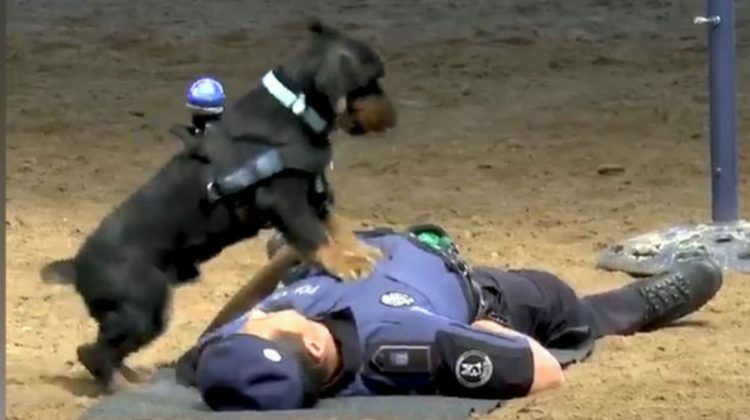 Poncho the police dog recently became famous online, after the Madrid Municipal Police shared a video of him on Twitter in which he is performing CPR on a fallen colleague. Despite being only a training simulation, Poncho’s life-saving skills and quick reactions left a lot of people impressed. As soon as his human partner collapses to the ground and remains seemingly unconscious, Poncho springs into action, running to him and jumping with his front legs on the man’s chest, while also laying his head on the man’s mouth to check his breathing. He doesn’t stop until the collapsed trainer gets up. The video has so far been watched by over 2 million people on Latino social media alone, most of whom can’t stop praising his performance. “Oh my goodness! Love the way the dog jumped up and down a couple of times, then lays his head at the mouth of the policeman and then starts back up again. God bless that precious dog,” one person wrote. “Love this very special fur officer! Amazing that they are capable of learning and using those skills to protect and serve! !” someone else commented. “Heroica” actuación de nuestro #Compañerosde4Patas Poncho, que no dudó ni un instante en “salvar la vida” del agente, practicando la #RCP de una manera magistral.